With Guardians of the Galaxy Vol. 2 opening in theaters this week, Marvel didn't hesitate to capitalize on the popular film with three new comics and one movie art book out on Wednesday. Besides the always pull-list worthy Batman, there's a bunch of new Marvel #1 issues. 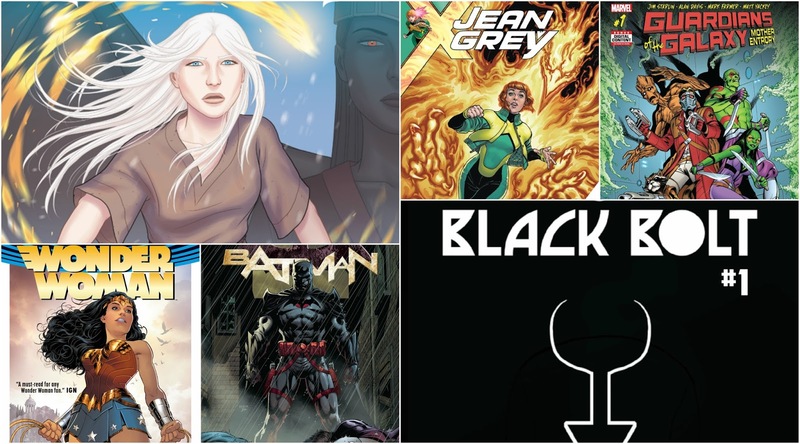 Check out Jean Grey, Black Bolt, and the controversial Secret Empire. Cullen Bunn and Brian Hurtt bring The Damned #1 from Oni Press. Take a look at these and more below for this week's highlights. Happy reading! THE BUTTON" part three! The cataclysmic events of DC UNIVERSE: REBIRTH #1 continue here! The Dark Knight and The Fastest Man Alive, the two greatest detectives on any world, unite to explore the mystery behind a certain blood-stained smiley button embedded in the Batcave wall. What starts as a simple investigation turns deadly when the secrets of the button prove irresistible to an unwelcome third party-and it's not who anyone suspects! It's a mystery woven through time, and the ticking clock starts here! Black Bolt imprisoned! But by who? And where exactly? The answers to both will shock you! But to learn those answers, Black Bolt must first win a fight to the death with a fellow inmate - The Absorbing Man! Award-winning science fiction writer Saladin Ahmed (Throne of the Crescent Moon) crafts a story as trippy as it is action-packed, with truly mind-bending art from the one and only Christian Ward! Space aliens have been coming to Earth for centuries-but not with any message of brotherhood or peace. They're here to hunt the toughest, most dangerous humans they can find. Only now their former prey have teamed up against them. Predators, watch your backs! The team of writer Greg Rucka and artist Nicola Scott weave the definitive and shocking tale of Diana's first year as Earth's protector. Paradise has been breached, Ares stirs and the Amazons must answer with a champion of their own...one who is willing to sacrifice her home among her sisters to save a world she has never seen. Wonder Woman's journey begins in this epic origin story! Collects WONDER WOMAN #2, 4, 6, 8, 10, 12 and 14. One of the great team names in Marvel history returns, in incredible new fashion! After the fallout of CIVIL WAR II, Ms. Marvel, Nova and Spider-Man quit the Avengers and strike out on their own! Along with Viv Vision and the Totally Awesome Hulk, these young heroes are determined to change the world their own way - and they're only the beginning! It starts as an idea. It becomes an ideal. But what happens when it turns into a movement - one so big even the Hulk can't stop it? Will one of the greatest X-Men of all forge a new future by their side? Will the Unbelievable Gwenpool be friend or foe? It's a super-team book for a new generation! Collecting CHAMPIONS (2016) #1-5. Synopsis Our heroes have made it to India! And if their enemies don't get them, the culture shock will! But before they even have time to settle in, evil Stand users are upon them. If you thought the enemies they fought before were strange, wait until you see what they're up against now. The trippiest road trip ever continues!